HC Renew™ hybrid cushioning film contains a special and precise blend of ingredients that allow for microbial biodegradation and it is tough, 100% recyclable and contains pre-consumer recycled content. HC Renew inflatable packaging uses a proprietary additive in the manufacturing process, attracting microbial communities found in environments such as landfills, to accelerate product biodegradability. AirSpeed HC Renew film offers space savings over other block and brace materials. Lowers fuel usage and decreases carbon emissions. 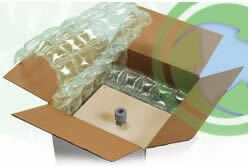 Fewer trucks needed for shipment compared to traditional protective packaging options. AirSpeed HC system is clean, fast, flexible, simple to use and cost effective. Significant ease-of-use benefits over more labor intensive options. A small amount of bio-additive is compounded with the standard HC film. The bio-additive attaches itself to the molecular polymer chains that form the plastic so that it is evenly dispersed throughout the plastic. After plastic is disposed of in a landfill, microbes attach to the additives in the plastic, digesting and breaking down the structure into biomass and carbon dioxide or methane. Depending on microbial environment, complete biodegradation can occur in one to five years. Compliant with ISO 15985:2004, and ASTM D5511-02: Anaerobic biodegradation of plastic materials under high-solids anaerobic digestion conditions. These tests simulate landfill environments. HC Renew biodegradable inflatable packaging contains a natural organic bio-additive that accelerates biodegradation of the film. Unlike other environmental plastics in the marketplace, HC Renew biodegradable film contains no heavy metals or salts, can be transported in high heat and has a longer shelf life than competing options. Heat, light and oxygen are not required for HC Renew inflatable packaging to begin biodegrading in a landfill. HC Renew film will biodegrade in anaerobic environments. Pair HC Renew film with the innovative AirSpeed HC machine, the industry’s ultimate inflatable, on-demand hybrid cushioning system and produce inflatable pillows at speeds of 75 feet a minute for void-fill, cushioning, containment, wrapping and packaging needs.